A pastor’s wife carries a huge load on her shoulders. She can often feel overwhelmed, isolated, wounded, or torn between family and church demands. Whether your pastor’s wife is a young mom or empty nester, she needs your prayers, friendship, and encouragement. For the next thirty days, would you be willing to pray for these women who sacrifice so much for the church? Let’s join together in praying the 30-Day Praying for Your Pastor’s Wife Challenge. We’re incredibly grateful for their ministries and for yours, too! The thought had been bouncing around in my mind for several weeks. I had discussed it with my husband, and I knew what I had to do. I expectantly typed a private Facebook message to an older pastor’s wife asking if she would be willing to take me under her wing. I knew she was very busy, and I didn’t expect her to agree. However, a few days later, I received a message back with a hearty, “Yes!” Since then (2015), our long-distance discipleship relationship has remained strong. Discipleship has become a part of the regular rhythm of many churches, especially within women’s ministry. Younger women are encouraged to ask older women to disciple them, and older women are encouraged to invest in the younger ladies. However, many pastors’ wives aren’t quite sure how discipleship looks for them, in particular when it comes to the local body. On the one hand, a pastor’s wife’s hesitation about discipleship is understandable. It can be awkward and sometimes unhealthy for a pastor’s wife to divulge personal struggles to another woman in her church family. Although some pastors’ wives have a mentor in their congregation, not all have that option. We are certainly in a unique situation when it comes to sharing personal information. Fellow pastors’ wives, you have one of the most precious roles in the church. You sacrifice so much for the good of your beloved church families. You serve as the primary support system for your husband, though your ongoing encouragement is not normally seen by the outside world. You invest in so many others. And so it is important that you allow others to invest in you as well. However, as I’ve talked to other pastors’ wives over the years, I’ve learned it can be difficult to take the time to think about our own spiritual needs. If we deprive our souls of ongoing discipleship and encouragement, we do ourselves a disservice. Without an older, more mature pastor’s wife with whom to dialogue, the dark burdens of ministry can lead us toward burnout, discouragement, bitterness, and other things that take our focus off of Christ. Therefore, I believe we greatly benefit from older, more experienced pastors’ wives discipling us. Paul, who is older and more spiritually mature, is speaking to Timothy, a young pastor, who needed help with the various challenges of ministry. Paul had already invested time and energy into equipping and encouraging Timothy for pastoral ministry, and Paul was not content for his training to stop there. Paul intends that Timothy take his training and pass it along to others. This same principle can be applied to pastors’ wives, who have a unique calling and role in the life of the local church. Older, more experienced pastors’ wives have insight, encouragement, and lessons to pass along to younger pastors’ wives. The older wives should entrust their training to young wives, who will later pass it on to other pastors’ wives. It’s interesting that Paul wasn’t in the same local church as Timothy. Generally, I believe that the best discipleship happens within a local church. However, when it comes to the lead pastor and his wife, there seems to be wisdom in finding an older pastor and wife for discipleship. For smaller churches, this will most likely happen outside of that local church. This is what we see with the relationship between Paul and Timothy. Paul trained many men throughout his life as a Christian, but he intentionally and uniquely trained Timothy as a pastor. 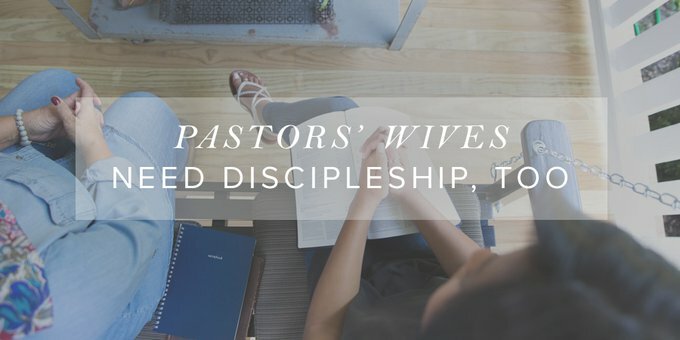 Pastors’ wives can disciple many women, but there is a unique training and discipleship that is especially helpful for other pastors’ wives. For example, how should we handle angry church members? How do we distinguish between gossip and someone appropriately opening up about others to their pastor’s wife without sin? What are ways we can encourage our pastor-husbands after they have preached a difficult sermon? How can we combat the loneliness that comes when fellow church members don’t pursue deep friendships with us because it would be too awkward to be best friends with their pastor’s wife? What do we do when our souls are wandering far from Christ, but we don’t want anyone to know because it could hurt the ministry? All of these situations would benefit from a seasoned pastor’s wife passing on training from her own experience in seeking Jesus through similar situations. My husband and I find ourselves revisiting the same conversation every few months. Another friend has gotten out of the ministry in large part because his wife was overwhelmed with the pressures of ministry. Ministry is devastating at times. Christians can be harsh and hateful. Our husbands are often criticized by friends in the church. Our friends’ marriages look great on Sunday mornings, but they are failing behind closed doors. Gossip about our family gets back around to us. We receive scathing letters tearing down the work we believe the Lord to be doing. All of these situations take a toll not only on the pastor but also on his wife. We need older women who have faced these situations to encourage our souls so that we don’t end up in an unhealthy place of not trusting Jesus. Bitterness, discouragement, and despair can quickly creep into our hearts. When this happens, it often affects our marriages and, in turn, our churches. Ministry has ups and downs, and it’s not wrong for our souls to react to that. However, it takes intentionality to maintain a healthy trust in and love for Christ through it all. I’ve slipped and slid through being a pastor’s wife for thirteen years. There are joyful and peaceful times of ministry as well as heartbreaking and devastating times. I started to feel the spiritual benefit of discipleship when a woman who had been a pastor’s wife for over forty-three years took me under her wing. Since then, she has encouraged me through many joys and burdens, most of which she has experienced personally. She’s quoted Scripture more times than I can count, and she’s prayed for me consistently since we started our discipleship relationship. I’ve been able to ask her about various situations about my personal life and the life of the church. She has spoken into many difficult situations that may have otherwise devastated my soul. I love Jesus more because of the example that she has set for me. The Lord has used that fateful Facebook message back in 2015 to encourage and challenge my soul through discipleship. Older, more mature pastors’ wives have golden experience and wisdom that will greatly benefit newer pastors’ wives. We not only have the joy of passing on our training, but we are to reproduce healthy, gospel-centered disciples (in this situation, healthy, gospel-centered pastor’s wife disciples!). What about you? How would your soul be changed if you found another pastor’s wife to disciple you? The Lord may use that woman to make a beautiful difference in your life.